Customer service/support handles a company’s issues, usually over the phone or via email. Companies and businesses that produce technical products like software or web hosting should also have a technical support staff to resolve their clients’ problems. There are many reasons customer service is important to a company or business. First of all, without customer support, it would be difficult for a company to survive because nobody is available to handle payments or answer questions or inquiries from clients and prospects. Customer service is often the only contact a customer has with a company. Remember that customers are the lifeblood of every business. They spend hundreds or even thousands of dollars annually with a company so if they have a question or issue with a product or service, they expect a company’s customer support staff to resolve their issues in a timely manner. Top Customer Hosting Support is a Must! As a customer, it’s your right to get the best value out of a product or service since you had to pay good money for it. But it shouldn’t stop there – a reliable web hosting provider should also provide sufficient after-sales support that will address any issues you might encounter with their service. If you’re looking for a reliable web hosting provider, customer support is in fact one of the most important factors you need to look for, as it shows a company’s credibility. With top-notch customer support, you can see that a company is dedicated to providing their clients with quality service and is continuously seeking to improve on their hosting service, particularly when addressing issues like downtime, errors, and loading speeds. As a beginner in website programming, having knowledgeable customer support would help you tremendously on technical issues. For more experienced web masters and online businesses on the other hand, having the best customer hosting support would mean less downtime and more opportunities to sell or gain popularity on the Internet. iPage has been in the web hosting industry for well over a decade. They are one of the best web hosting companies that provide affordable hosting solutions for businesses and organizations, be it for commercial or personal use. iPage offers good flexibility, hosting more than a million websites and serving customers in 150 countries. iPage considers three important things when it comes to customer support: website, email, and security. They promise to provide just the right features to create amazing websites and provide security to them and to site visitors. What’s more, they also have a functional and spamless mail. 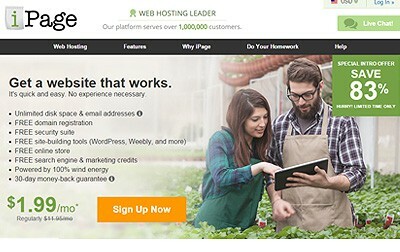 The web hosting company also claims to be eco-friendly. To offset energy consumption, iPage acquired Renewable Energy Certificates, thus reducing its carbon footprint. As an iPage customer, you are guaranteed that your websites are 100% powered by wind energy. iPage has a team that is dedicated to give you advice and solutions even after business hours. iPage made it possible to attend to your problem as quickly as possible, so that you would not have to wait longer than 2 minutes. Contact them toll-free, via telephone, or with agents online through live-chat. Reporting with a trouble-ticket system ensures that your issue would be resolved as soon as you made it known. Expect to talk to someone who could understand your situation: from simple trouble-shooting errors with your website’s script, making proper corrections to your bill, to adjusting your server’s loading speed. This refers to information iPage has collected to answer common FAQs (Frequently Asked Questions) for customers. It also compiles a series of tutorials and instructions on how to use the iPage’s user interface and website building tools. These can all be accessed anytime online and the list of helpful tips for you to use is extensive. iPage Customer Support: Is it Ideal for Online Business? iPage’s customer support is ideal for online business websites, pretty much for the reason that iPage’s customer support team can maximize the time for an online business to sell its products or services globally on the internet. For example, iPage’s trained customer support team can guide any new business on trouble-shooting their website’s errors, slow loading speeds or downtime. What’s more is that their customer-support team would not waste your time since iPage instructs its agents to not let customers wait for longer than 2 minutes when contacting them through their telephone lines. Also expect a friendly and knowledgeable service agent to aid you in resolving any of your issues when running your website. Collectively, because of the said reasons, iPage has become one of the most reliable website hosting providers for online businesses around the world. They provide excellent after-sales service, ensuring that you get consistent server to browser speeds, while incorporating your feedback (both positive and negative) towards improving their service further. I’ve been waiting over an hour for someone in support to answer the phone….guess the 24/7 and 2 minute wait is bunk.